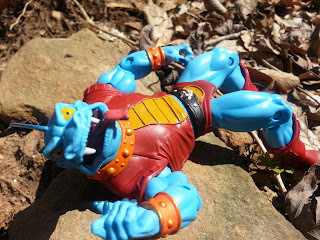 Like the majority of figures in the Masters of the Universe Classics line (MOTUC), Fang Man uses some shared parts and thus he is similar in size to all other regular figures. Because of the character's hunched over appearance in the Filmation cartoon, Mattel and the Four Horsemen have chosen to use an alternate neckpiece (a new feature in this line) and shaped torso armor to replicate the look. It works really well and ensures that while there's a consistency in the line, Fang Man looks rather unique. He still comes in closer to 7 inches in height rather than the 6 inch mark. Fang Man vs. Whiplash, round 1: FIGHT!!! 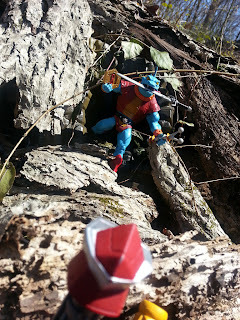 Fang Man is as well articulated as any other MOTUC figure, and perhaps is even more articulated. Like most other MOTUC figures, Fang Man has hinged ankles, boot swivels, hinged knees, thigh swivels, ball jointed hips, a waist swivel, an ab hinge, peg/hinge ball jointed shoulders, bicep swivels, elbow hinges, and wrist swivels. Unique to the character is his extra neck piece which gives him both a jointed head and a ball jointed neck. That's not all, however, as Fang Man's hilariously wagging tongue swivels and can be positioned lolling out of any side of his mouth. He's well articulated and well put together. Very solid with no QC whatsoever. The sculpt, a mix of new and old pieces, is excellent. He's very lizardlike: check out those creepy fingers and that excellent head sculpt. Translating the very basic looks of Filmation characters into the MOTUC style doesn't seem like an easy task. Sometimes it works well (see Shadow Weaver) and yet other times it fails (see Eternos Palace Randor). While perhaps a tad silly, I think Fang Man's head sculpt is truly a winner. It has so much character to it that unless you vehemently oppose the Filmation cartoon, you can't help but smile at the look of this guy. New elements like the excellently sculpted tunic and the new trunks with a little sculpted Fang Man on the belt really bring this figure together. The paint work is very neat and clean and the colors really "pop" on him (much better than randomly reversed bodyparts do, anyways). He's an exceptionally bright character with a nice color scheme. The blue skin with red, yellow, and orange details really makes the figure feel like it could have existed in the first few waves of the vintage line. Most significant, however, are Fang Man's yellow eyes. They really stand out against his blue skin and add to the overall reptilian look. that I can't take away!" Now comes my favorite part of any figure: the accessories. Fang Man is loaded with high quality accessories that aren't just weapons, but story elements from two episodes of the Filmation cartoon. First, he comes with the Wheel of Infinity, an artifact used by Skeletor to travel back to the time before Castle Grayskull was built in the episode The Time Corridor. While this is a simple accessory, it's really cool that a story based item was included. Just like in the cartoon, the artifact is a medal with an infinity sign in the middle, surrounded runes that look like hourglasses. Fang Man can easily grip it in his hands. Second, Fang Man comes with the Sword of the Ancients, a very cool looking sword that played a role in the episode Masks of Power. 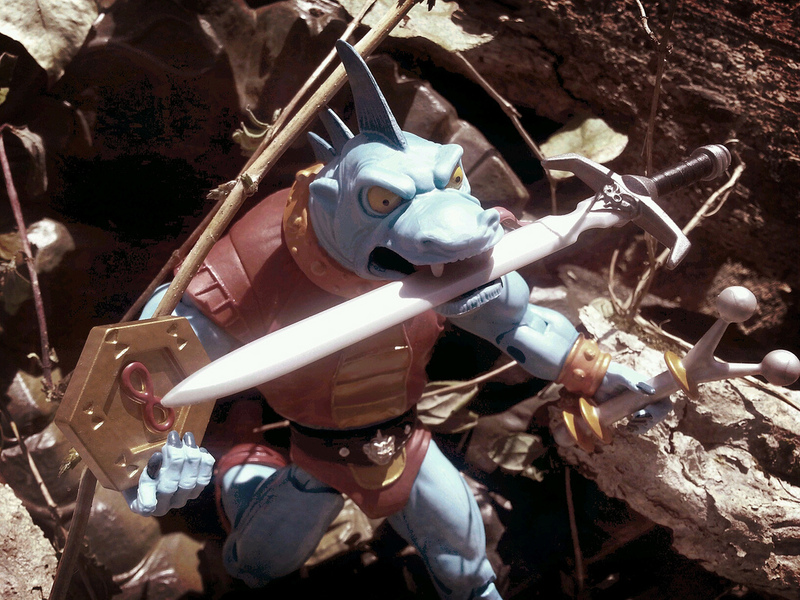 It's a fairly standard looking sword, which is nice as we don't see many of those in MOTUC. The third accessory is the force field rod, a weapon that apparently appeared on Fang Man's Filmation character sheet. It's pretty a simple sculpt and looks like a futuristic slingshot with no sling. Maybe it fires energy bolts or is used like a cattle prod? Anyways, all of Fang Man's accessories are stellar and if you're willing to put one in his mouth, he can carry all of them. Overall, while I love Ram Man, Fang Man might be tied with him for my favorite MOTUC figure of the year so far. Excellent articulation, paint, sculpting, and accessories just combine to make this one of the most fun figures I've bought this year. If you're looking for a Fang Man, you'd better get cracking as I imagine he'll just get more and more difficult to find. Excellent job by Mattel and the Four Horsemen for creating another Confirmed: Epic figure. 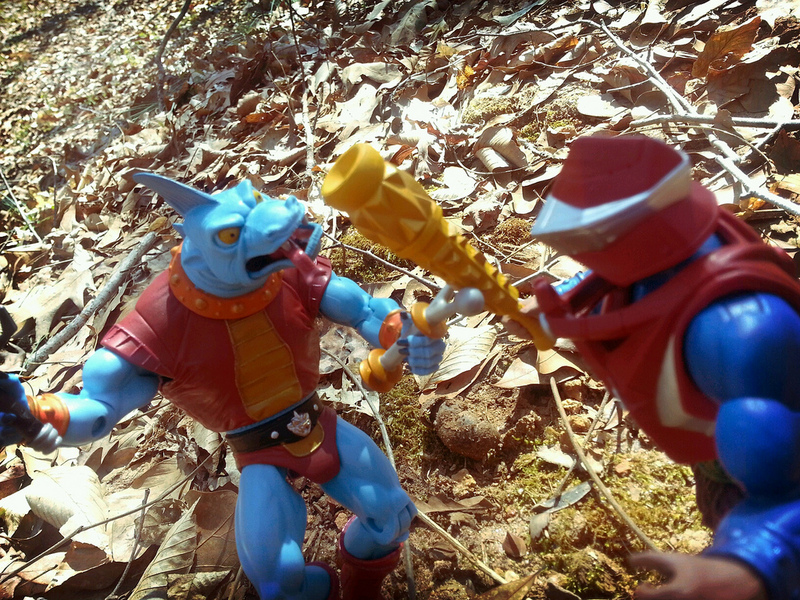 Barbecue17 loves MOTUC figures and the Filmation cartoon a little too much. He's eagerly awaiting the day that Imp makes it into the line. Check out his pictures cool toylines and action figures on his Flickr account.